TAKE TWO ended its first season with one heck of a twist: Eddie (Eddie Cibrian) was arrested after a video framed him for a murder. Meanwhile, after last week’s kiss, Sam (Rachel Bilson) and Eddie slept together, and vowed it wouldn’t happen again…only for the duo to fall back into bed and generally be adorable as they couldn’t stay away from each other. But even that had its own complications: Sam scored a coveted movie role, which could jeopardize—or at least pause—her newfound P.I. job. What’s in store for Eddie after his arrest? Andrew Marlowe: If the TV Gods grant us a second season, we’re really excited to continue the storyline, and confront the challenges facing him. He’s up against his big nemesis, and the question really is how is he going to get out of the situation he’s been painted into? Terri Edda Miller: And Sam is going to have a lot of decisions to make. She’s landed this job, but she’s going to want to find out the truth of what happened to Eddie. AM: We’re really excited about the complicated, emotional storytelling we have in front of us. What happened between Sam and Eddie in this episode, them having to deal with that, and this [problem] of her having her job offered and him being in a situation that he may not be able to get out of…we think it’s going to allow us to launch next season in a cool direction. Eddie took legal responsibility for Sam early on in the season. With him now facing murder charges, how will this impact their arrangement in the eyes of a judge? AM: We think it presents some really great complexities we’re looking forward to tackling. TEM: Ever since that happened in the courtroom, their relationship has changed. So that will complicate things. The series airs Thursdays at 10/9c on ABC. Deacon has been a thorn in Sam and Eddie’s side this season, and certainly Eddie’s arrest will only complicate things. Do you view him as a small bump they need to overcome or is he more of a a long-term foe? AM: At this point, he’s more ingrained in the overall DNA of the show, at least as far as the second season is concerned. We like having this guy out there as a nemesis, a foil, for Sam and Eddie. He’s a formidable opponent. But he’s not somebody who we’ll be dealing with every episode. Our bread and butter will be the case of the week, and if the TV Gods invite us back, we have an interesting arc planned for Deacon, and what the conflict is going to be for him, Sam, and Eddie. He’s going to serve as a catalyst for several things. The other big move was Sam and Eddie sleeping together, and trying—and failing—to stay apart from each other. What was it like penning that dynamic, especially since it was lighter than a lot of eventual will they/won’t they couplings end up being? TEM: It was just so much fun to write that. I love that dynamic. I remember feeling the way they feel at certain points in my life. What a delicious and, at the same time, painful thing that can be when you’re really attracted to somebody, and you’re trying really hard not to be attracted to that person. Both of them are trying to hold on to what they have and what they know. But they’re so drawn together that they can’t help melting when they’re in each other’s presence. To write that and to see Eddie and Rachel perform that was just delightful. And Holly Dale directed it beautifully. AM: We like creating characters who are very much in control all of the time, and it’s something they value, and due to circumstance, they lose a bit of control. So we see how much they can fight it. It’s a lot of fun. TEM: It’s a lot of fun. And also when we created the characters and created the story, we were always heading towards this. We knew that this would happen between them, we knew this would happen in a more real-world way than we had done before, because of the places they’re in in their lives. This was the thing they both needed in the their lives. They needed a shot a redemption, but one of the things Eddie needed more than anything else is needing to be open to having a relationship and let someone get on the inside. For Sam, she was pushing everybody away because of what happened with her fiancé. So that’s why them coming together is so explosive: this is what the audience has felt they wanted all along. AM: This is what they need, but it also terrifies them the most. There’s a lot of possibilities for the future with what doors open and what doors close. We felt having them be at this point this early in a show’s run is really a reflection of modern times and modern relationships, where people negotiate these questions. These situations are fraught with dramatic possibility. That really attracted us to it. When did you tell Eddie and Rachel you’d be making this move so soon in the show’s run and what was their reaction? TEM: We told them early on what the general trajectory of the show would be. AM: And that it was our aspiration to get the characters together, physically, early in the show’s run. They were on board with everything we wanted to do. They were our partners in this process. They were excited about the idea. They thought it was a fantastic direction for the show to go. With Sam being an actress—especially one post-a high-profile breakup and spiral—interest in their relationship is bound to be intense if others discover what’s going on. How might they handle that in a second season? AM: These two characters don’t relish that attention. If that’s going to come their way, it’s going to be very complicated for both of them. The nice thing is we’re dealing with two actors who know what that looks like, because at various points in their life, they’ve been in the public eye and know how challenging it can be. We think there’s interesting storytelling to be had when a character like Eddie Valetik—he puts the private in private investigator—suddenly may become more of a public figure because of this and become tabloid fodder. That’s not going to be a comfortable place for him to live. TEM: It’s not going to be comfortable for either of them. Because it’s certainly not the image that Sam is trying to put forward at this time, as she’s trying to resurrect her career and she has this amazing opportunity to do it. She’s going to want people to focus on what she’s doing in a positive realm rather than her romantic entanglements. In the real world, certainly agism plays a part for actresses, as roles often wind down and it’s more difficult to get consistent work. As Sam is navigating her career, will that looming possibility be addressed in the show? TEM: First of all, as a writer, we’re trying to remedy that situation! [Laughs.] But secondly, it’s going to be trying for her, which is good drama. Do you anticipate the show returning relatively close to where the season left off, or will there be a time jump? TEM: We’ll see what evolves. AM: We’re still talking about it. [Laughs.] I think what we can say is we wouldn’t want to rob the audience of the immediate aftermath of what is happening. The first episode, we would be playing with some of the dramatic complications there. TEM: That’s some of the back and forth Andrew and I have when we’re developing a story: we talk about when is the best possible moment in which we can bring the audience into the story and tell our story the best possible way. With an entire season under your belt, what did you learn about what best works for TAKE TWO? TEM: We learned a lot of things. We learned how versatile Rachel is. We learned about Monica, her comic timing and dramatic timing are brilliant and a huge asset. We learned in our actors what their biggest qualities are and what they bring to the show so that we can go deeper into character and spread them out and be more focused in a strong way. AM: We really like this family we created, so learning all of the potential interplay dynamic and elements are is something we can really take advantage of when we come to season 2. But there’s going to be another level of this: [with a renewal] Terri and I will go back and rewatch all of the episodes, and we will learn a whole host of new lessons. Having just finished the season a few weeks ago, there’s a lot of us being inside of it and knowing what we wanted. And inevitably, there’s a process where you have to take a step back and look at it all again fresh, and see what you can take advantage of. Without spoiling anything too specifically, what didn’t make the cut in the first year you’re hoping to do in a second season? AM: Season 1, doing 13 episodes, we were like, “Wait, we’re done?” We’re used to doing 22, 24! We have some great ideas. TEM: We had a great opportunity to highlight Detective Rollins in one of the episodes and share some backstory. We would like to do the same with Xavier [de Guzman] who plays Berto. TEM: He is such a great actor. And Lamont [Thompson], who plays Zeus. AM: And Alice Lee. We’d love to be able to bring these guys to the floor. A first season is so much about establishing your leads. Now we feel like they’re established. TEM: Certainly we’d like to see Berto and Monica out in the field more. What have you heard about a potential season 2? AM: We know we have lots of fans and a good core audience. I think that folks are taking a look at how we’re doing overseas, since we just premiered in Germany and we’re going to be premiering in France relatively soon. But overall, we’re very hopeful. All we can do is cross our fingers. Did you enjoy the summer run or are you hoping they move you in-season? AM: We designed the show for summer. It’s a little lighter, a little breezier than some of the other stuff we’ve done. We view this as a bit of a rosé; it’s a little bit more light-hearted than some of the dark elements right now. If they wanted to move us, we would, of course, figure it out. Is there anything else you’d like to say about making the first season? TEM: We’re really grateful to all the fans who showed up. We know the show is always better for the people who are invested in it and let us know how they feel. We feel really good about it, and we had a great experience working with wonderful people. And we learned a lot of new things in the process! 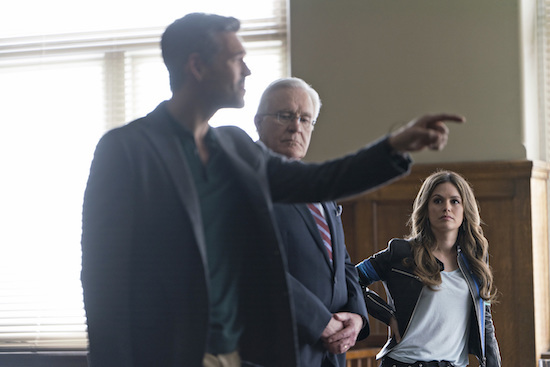 What did you think of the TAKE TWO season 1 finale? And for more from the cast, be sure to check out the official Instagram account, as they go live for the West Coast viewing! I LOVE THIS SHOW! All the characters are excellent! Praying for season 2 as a mid season replacement!